Area X-6 is the sixth course of Secret Storage and the ninety-ninth course overall in Mario vs. Donkey Kong: Mini-Land Mayhem!. 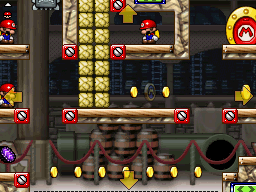 The Mini Marios all begin at or near the top left corner, with the exit door near the middle right. In order to reach it, they must simply be guided via a series of Red Girders, Purple Conveyors, and Blockers to it while evading Thwomps. The M-Token is located near the very center, blocked off by Crumble Blocks on both sides. To collect it, one of the Thwomps must be led via Conveyor to a gap along the center, then a Purple Conveyor must be drawn to move the Thwomp in line with the left Crumble Block obstruction, allowing a Mini Mario to collect it. The Mini Mario Card is located at the top right, to the left of a Thwomp. A Mini Mario must simply use Blocker platforms to pass under the Thwomp, and ensure that no other Blockers are active so that the Thwomp can smash the Crumble Blocks, allowing the Mini Marios to pass by. In order to earn a trophy, the player must score 14600 points. In Plus Mode, the two Mini Marios must be guided to the exit door first, followed by the two Mini Donkey Kongs. In order to earn a trophy, the player must score 13300 points. This page was last edited on September 18, 2018, at 06:43.